Celebrating Nikolaustag (6. December) and Heiligabend (24. 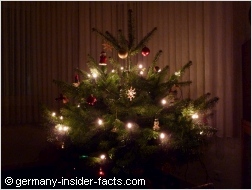 December) belongs to the well-loved and most important German Christmas traditions. Most of us love to gather near the Christmas tree with the family, enjoying a special meal, and have fun. Christmas presents are arranged around the tree, and everyone, especially the kids, guess which package might be theirs. Little tags are added to the presents, so everyone gets the right gift! Can you imagine the kid's excitement when they enter the room to see the tree and the nicely wrapped gifts? Okay, but first I introduce you to Nikolaus Day, which is celebrated earlier in December. Saint Nicholas (Nikolaus), Santa Claus (Weihnachtsmann) and the Christchild (Christkind) ... they all bring gifts to children (and adults), either on Nikolaustag (6th December) or on Christmas Eve. Saint Nicholas of Myra (today Turkey) was a bishop in the 4th century. Very little is known about the historical Saint Nicholas. However, lots of legends and folklore surround the bishop, who is the saint patron of Russia, Croatia, Serbia, children and sailors. He was known as a generous man, a secret gift giver, who put coins in shoes of those who were in need, and he had a great fondness for children. No surprise, he became the model of Santa Claus. 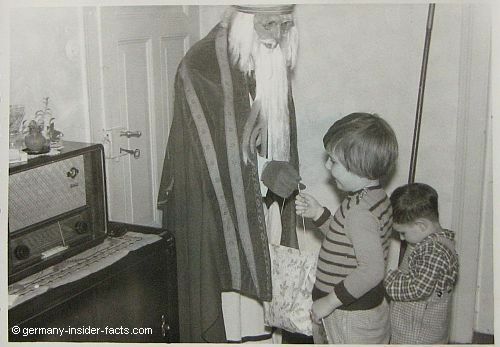 Before the Reformation, Saint Nicholas Day was the day children received their Christmas gifts. Reformer Martin Luther didn't approve the veneration of saints like Saint Nicholas. He "invented" the Christchild, a spirit-like figure with blonde hair and wings like an angel. It took about 200 years until the Christchild was adopted by Catholic families in southern Germany and Austria. At the same time the Christchild was more and more replaced by the Weihnachtsmann (Father Christmas) in the Protestant regions of Germany. Anyway, back to St. Nikolaus who often visited children at home. We kids were always a little worried what he would tell us from his golden book. Mysteriously, Nikolaus had listed our bad behaviour throughout the year in this book. How could he know? After we promised to be good next year, we had to recite a Christmas poem and jump over the rute (rod, usually a small tree branch) to receive a slight smack on the back with the rod. Occasionally, Nikolaus was accompanied by his helping hand Knecht Rupprecht, who would take over the job of giving us a smack. That's me and my brother in the picture, and this was towards the end of Saint Nicholas' visit, we got a bag with sweets, nuts and fruits, at last. My brother still looks a bit guilty, but he got his bag as well :). In Germany, Nikolaus was originally wearing a bishop's robe and he was a different figure than the Weihnachtsmann (literally translated Christmas man). However, these days Nikolaus and Santa Claus seem to be mingled. Finally, Christmas Eve (Heilig Abend), the day that has held the family in eagerly anticipation for weeks, has arrived. 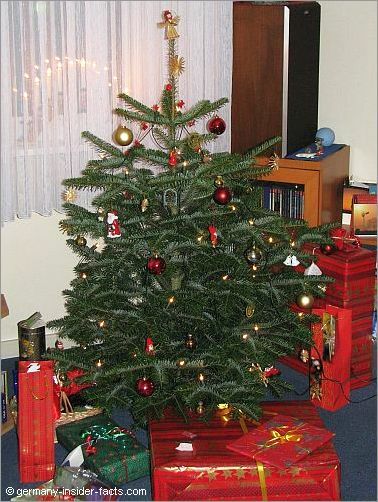 When I was a child, it was very common that the kids didn't see the Christmas tree (Weihnachtsbaum) before Heiligabend. This has changed slightly. Some families decorate the tree together with the kids a day before Christmas to reduce the stress from the working parents. Although most people don't have to work (except those working at stores and public services), shops are usually open on Heiligabend (24th) until the early afternoon. Then public life in Germany falls quiet. It is a widespread custom to visit the graves of family members in the afternoon, before the Christmas celebrations begin. When it gets dark, families gather around the Christmas tree, singing Christmas carols (Weihnachtslieder) and share their joy with the gifts everyone unwraps. Finally, they join for a simple meal around the nicely decorated table. Later on Christmas Eve many people go to the Midnight Mass or Christmette. Christmas Day is called 1. Weihnachtsfeiertag and Boxing Day is 2. Weihnachtsfeiertag. These days are reserved to visit, or invite, grandparents and other family members for a festive Christmas meal, or just to stay at home and relax after all the festivities. Both days are public holidays and shops are closed. Want to bring a bit of good old German Christmas feeling to your home? Here are some suggestions for you. Choose one of the decorative tin chests filled with delicious ginger bread and you'll have a perfect Christmas gift. 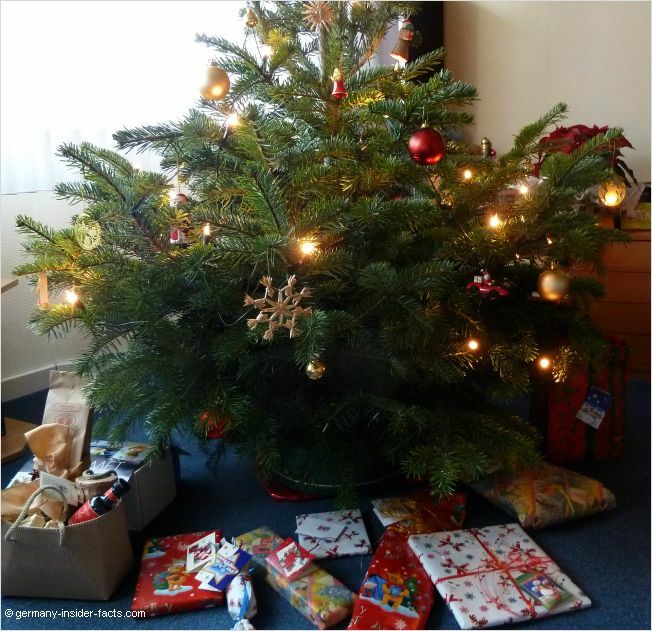 My friend Marion from inside-munich.com shares how we celebrate Christmas in Germany. 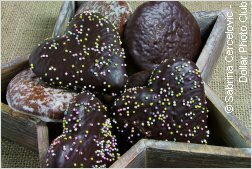 It is a very personal book that gives details about all our beloved traditions, including a few original German Christmas cookies recipes. For everyone with German roots or a favour for our country, this book is highly recommended. It makes a lovely Christmas gift. 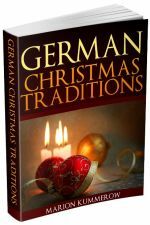 Christmas Traditions in Germany is available at Amazon.com as ebook for the kindle reader, or paperback when you prefer a real book.